Andy Robbins caught the recent Huey Lewis and the News performance at the Marina Civic Center in Panama City. He wrote up this review of the show and we hope that you enjoy reading it as much as we did. Anyway, onto the show. It was a blast. Huey affirmed the theory put forth by many a comedian that all singers want to be comics, and vice versa. He was funny, charming, and after a 30+ year recording career, the man hasn’t lost his chops. He sang every song as if he’d just recorded it yesterday. He started out with the hits, of course, and about 10 songs into the show he said they were going to take a risk and throw in a new song. He told us, that even if we didn’t like it to act like we did, because it would make him feel good, make the band feel good, and would make the rest of the show just go a lot better. Of course, after an intro like that, how could we not cheer and applaud? To top it off, the song was good anyway, so the applause was sincere and deserved. Then, another part of the show he said that gives the rest of the band a chance to show off their individuality with an a capella set. They played two a capella songs, with Huey’s accompaniment on harmonica (which wasn’t actually just for this part of the show, but the entire show) and then got back to the original game plan, closing with a couple covers and the rest of the hits. He praised Panama City and the venue. Of the intimate setting he said, that if it was any more intimate, there would only be two people. All part of his comedy arsenal. But as I was walking to my car, I saw only about 5 or 6 people waiting by the stage exit, so I decided to stick around and see how it all played out. About 10 minutes later, a couple guys from the horn section emerged from the door, waved, and said “Thank you, great crowd tonight” and the usual platitudes. If someone asked if they could get something signed and a picture, and he said, “Sorry, I have to be in that 1st van back to the hotel.” In that van they got, and off to the hotel they went. So a few minutes pass by, and drummer Bill Gibson walked out. We all started talking to him, asking for pictures and autographs, and he was more than happy to oblige. There weren’t many of us there and it didn’t take very long, so he basked in his moment. There was a young lady standing there who had gotten his drumsticks when he walked off stage, so I am sure he was happy to sign those. After all that fun was had, the man himself walked out and saw the crowd awaiting his arrival. He was accompanied by a manager – a little British dude that was telling people that we could only get one thing signed, and ‘no pictures” while trying to push Huey into the van. Huey exclaimed, “THESE ARE MY PEOPLE!” So, of course, he was ignoring this guy and signing anything and everything that was handed to him, taking any and all pictures requested, and chatting with us. I was maybe 3rd in line and had actual CD liners, whereas the rest of the people were handing him the article from the Entertainer or a poster they’d bought before the show. He took my CD liners and said, “Three? You have three of my CDs? You must be a fan from way back!” I said that I was indeed, and that since Hall and Oates was here last year and now HLN, I feel like my youth was catching up to me. I asked if he would take a picture. He said he would, and grabbed me by the head like an uncle or older brother would. After the picture was taken he said, “I’m glad you enjoyed the show.” I said, “I did. It was probably one of the best ones I’ve been to involving career artists.” I think he liked that. 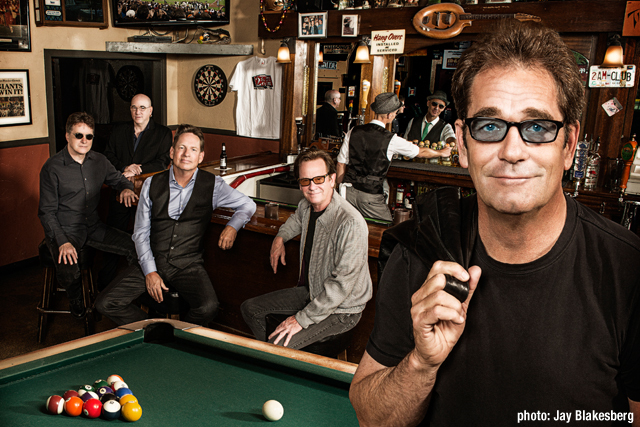 Huey Lewis and the News proved on May 1, 2014, that the heart of rock and roll is still beating. This entry was posted on May 5, 2014 by 850music in Posts and tagged review.